I love everything about autumn. Dazzling colors, cold nights, the smell of apple spice, pumpkin lattes and drizzly days like the one we have since morning. Its just the right weather to crave for a spicy yet comforting food. So, sipping a cup of hot coffee in my comfy couch I started digging my recipe files trying to decide what to make for lunch and look what I found? 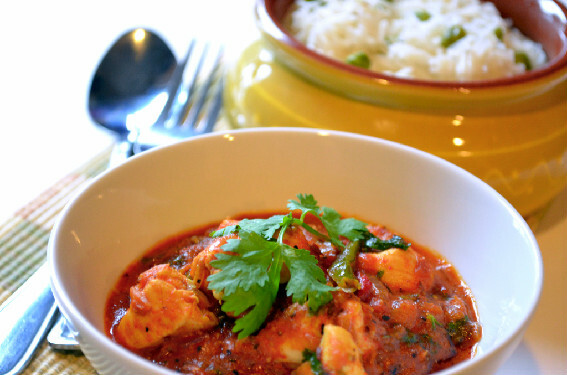 A simple spicy and aromatic dish that is sure to comfort your soul on days like this. Serve it with peas pulao or roti, it equally tastes delicious. Here’s how to make it…. In a deep skillet, heat oil on medium. Add ginger-garlic paste and saute for a minute until the rawness disappears. Add chopped tomatoes, cumin powder, coriander powder, chilli powder and fennel seed powder. combine. let it cook on medium flame until all the tomatoes turn soft and resemble a thick gravy. Add diced chicken pieces and mix well with the gravy. Cover and cook on medium flame until the chicken is cooked. Remove the lid and add ground pepper powder. combine and add freshly chopped cilantro. Turn off the flame. 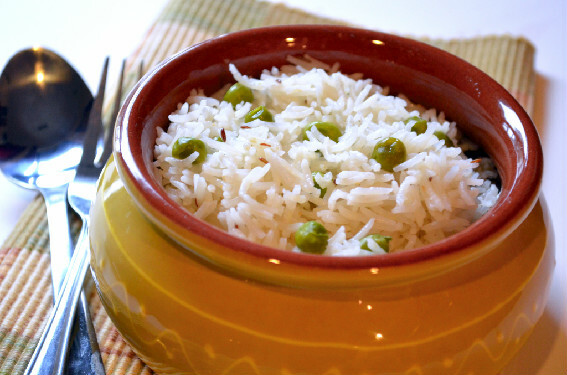 Serve hot with peas pulao (recipe follows) and/or roti. Heat oil in a pressure cooker or a deep sauce pan. Add shahi jeera, and bay leaf. saute for a few seconds until a nice aroma comes out. Add ginger-garlic paste and saute for about a minute until the rawness disappears. Add basmati rice and stir gently for about a minute. Add 1.5 cups of water, salt to taste. Do the taste test. If the water is salty it would have the right amount of salt by the time the pulao is cooked. Cover with a lid and cook until 2 whistles on high flame or if cooking in a sauce pan cook on medium flame until all the water evaporates and the rice is cooked thru.